Halfway houses are institutions that are commissioned, mainly by probation offices, to provide a variety of aid such as accommodation, meals, employment support, and living guidance, etc. to probationers/parolees who have difficulty in promptly becoming self-sufficient due to having no residence or no one to rely on or those requiring urgent aftercare as a discharged offender. As of April 1, 2010, there were 104 halfway houses nationwide, with 101 of them being operated by juridical person for offenders rehabilitation and one each by a social welfare juridical person, special nonprofit corporation, and incorporated association. Of them 90 were for males, seven for females, and seven for both males and females. The total capacity was 2,320 persons, being comprised of 1,827 male adults, 312 male juveniles, 134 female adults, and 47 female juveniles (Source: The Rehabilitation Bureau, Ministry of Justice). Fig. 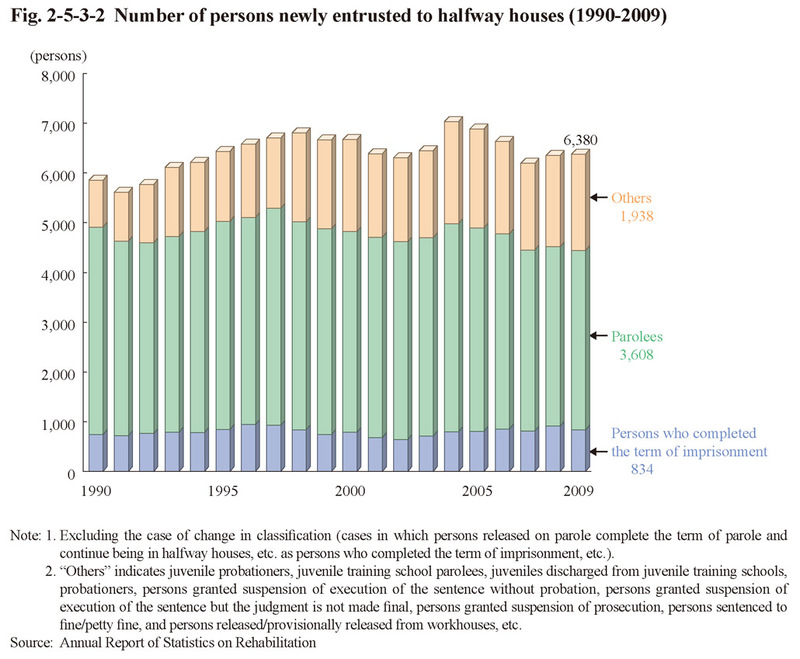 2-5-3-2 shows the number of persons newly entrusted to halfway houses over the last 20 years. 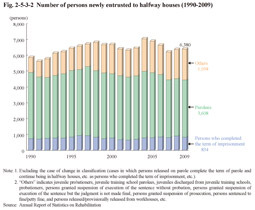 The number of persons newly entrusted in 2009 was 6,380, of which 3,608 (56.6%) were parolees and 834 (13.1%) those who had completed their sentences. Halfway houses have been making the effort to enhance the functionality of the treatment they provide, such as through introducing Social Skills Training (SST) and education on the harmful effects of alcohol/drugs. In FY 2009, 45 halfway houses implemented SST and 30 educations on the harmful effects of alcohol/drugs (Source: The Rehabilitation Bureau, Ministry of Justice). The Ministry of Justice and the Ministry of Health, Labor and Welfare collaborated in commencing community settlement support measures in FY 2009 for those facing difficulty in becoming self-sufficient due to their age or being disabled and with no residence. These measures can be used to enable those facing difficulty in receiving welfare support immediately after being released to be admitted to a halfway house in preparing to receive welfare support and provided with guidance/training on adapting to a social life. 57 halfway houses designated to fulfill such roles now have welfare staff members with specialized qualifications, etc. and the necessary barrier-free facilities, etc. Of those that left halfway houses in FY 2009, 27.1% returned to rented houses, 17.3% to their workplaces, and 15.5% to their relatives or close associates. The most common occupation when leaving a halfway house was laboring at 36.9%, followed by the service industry at 9.4%, while 40.4% were unemployed (Source: The Rehabilitation Bureau, Ministry of Justice).